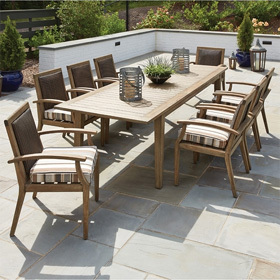 This complete lounge set from Woodard was designed to provide deep comfort during intimate patio gatherings. The arrangement's centerpiece is a deluxe chat-height fire table that is sure to bring warm ambiance to your outdoor space. The table's ornately detailed aesthetic is matched by the coordinated Belden seating, which features beautiful, hand-forged aluminum frames, stately back emblems and generously sized cushions. Fire Table 48"RD. x 25"H 91 lbs.